“I NEVER LOSE!” Ivan Poddubny was a rare 6-time world champion, having a professional career for over 40 years. This richly rendered biopic follows the incredible journey of an early 20th century world celebrity, from his modest roots in rural Russia to the world stage in Paris and 1920s America. 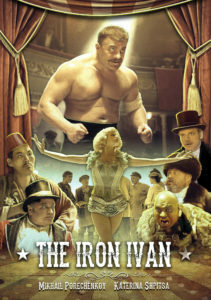 A stunningly filmed period piece, the film follows the iconic strongman’s sporting career spanning 45 years, beginning in a circus and culminating in six World Championship and Olympic titles. It also tells the story of a legendary wrestler who is remarkably trusting and easily deceived, who experiences epic victories alongside enormous changes of fate. After the Revolution, Poddubniy has the opportunity to live glamorously in the West, but instead he chooses to return to his homeland, not to the big city but to his little village by the seaside with the woman he adores. The all-star cast includes Mikhail Porechenkov (9th Company, Svyaz) who was nominated for Best Russian Hero of the Year for his role as Poddubnyy by the Russian National Movie Awards, Katerina Shpitsa (Metro, Flight Crew), Yuri Kolokolnikov (Game of Thrones, The Americans), and multi-award winner Denis Lavant (Holy Motors, Beau Travail, Boy Meets Girl).